Homeowners can expect cedar shake siding prices to vary from $3 - $6.50 installed. The price is inclusive of all costs including the shake shingles, installation, project materials and labor. Low to Mid Cedar Shakes: $1 - $1.75 per sq. ft. The cost of the lower to mid-range cedar shakes will be on a per square foot basis ranging from $1 - $1.75. The price may be for the white cedar rather than red cedar. The white cedar isn't as long lasting or durable as the red, but it does slowly change to a nice silver color after a few years. Mid To Premium Cedar Shakes: $1.75 - $2.50 per sq. ft.
You can expect to pay between $1.75 and $2.50 per square foot for these mid to premium shake shingles. The price may be for the traditional red cedar, this cedar is long lasting and more durable than white cedar. Red cedar can darken over the years making it look almost black and blotchy. It is produced in Pacific Northwest. Find pricing on all materials using our siding calculator. Some of the other project materials you may need include housewrap, shingle nails, trim pieces, corner pieces, decorative accessories and fascia, these are items that will often be required in siding projects. These materials differ in price, but a realistic price would be between $1.00 and $2.00 per square foot. Other Project Materials: $1 - $2 per sq. 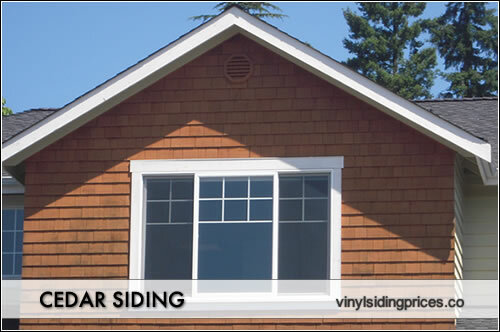 ft.
Cedar siding prices for installation vary from $1.00 to $2.00 per square foot. The installation of shingles is an easy process which can be accomplished using a nail gun. The price is along similar lines to that of vinyl siding. You can expect a raise in price to $2 per square foot should the shingles need to be treated or stained on site. Cost of Installation: $1 - $2 per sq. ft.
Low to Mid Cedar Shake Project: $3 - $5 per sq. ft. The lower to middle ranged projects will cost between $3.00 and $5.00 per square foot, this is the installed price. The pricing includes the shingles, installation, labor and other project materials which may be required. Mid To Premium Cedar Shake Project: $5 - $6.50 per sq. ft. The middle to premium projects will cost between $3.00 and $5.00 per square foot, this price is also fully installed including the shingles, installation, other project materials and labor.